The Penelope hanging is a large 16th century appliquéd wall hanging made for the Countess of Shrewsbury at Chatsworth, and displayed at Hardwick since the late 16th c. Originally there was a set of five, although only four hangings now survive, each depicting noblewomen from history and mythology, flanked by personifications of the Virtues. Penelope was the faithful wife of Ulysses and the virtues of patience and perseverance which she embodies are represented by the figures either side of her. These hangings are rare examples of the rich and sumptuous textiles used for interior decoration and have been studied and published by the textile historian Santina Levy. From 1909 to the present they have been displayed in large glazed frames. Due to their age and fragility their deteriorating condition the hangings have been a concern for some years. 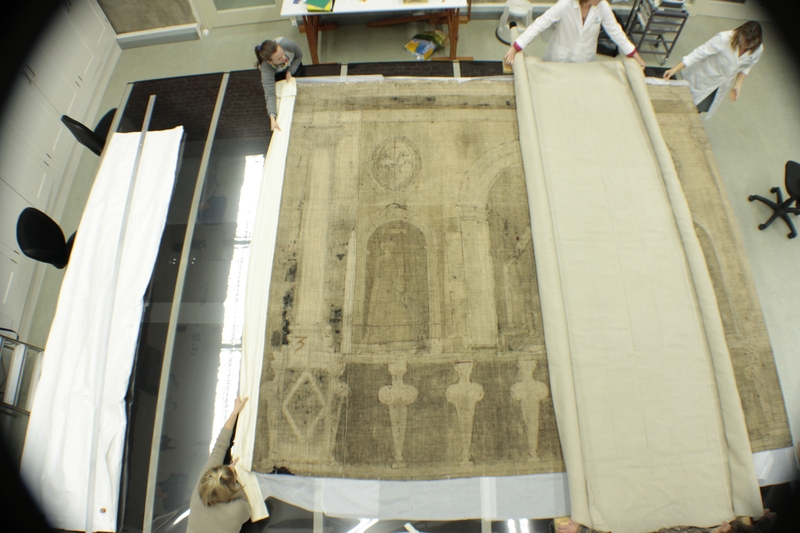 A grant from the Wolfson Foundation has enabled the Conservation Studio to undertake the treatment of the ‘Penelope’ hanging as a feasibility study, to inform the future approach and display for the remaining hangings. This treatment involves stabilising the fragile and brittle silk with an overlay of conservation grade nylon net. One of the keys to the success of this treatment is to match the dyed colour of the nylon net to the subtle differences in tone of the original silks. The nylon net is stitched in place using a very fine polyester thread. In areas which are too brittle to stitch through without causing further damage, such as the faces, a fine silk chiffon coated with adhesive has be used to stabilise the fragile painted silk. During the week of 18th July 2011 the Penelope hanging was removed from its frame at Hardwick by a team, including a specialist furniture conservator and two textile conservators as well as regional and property staff, who packed it for transport to the Blickling Textile Conservation Studio where it has now arrived. Removal revealed that the hanging is larger than the frame. Following the installation of a specially made table, the hanging is now being examined to further evaluate its condition, especially of the reverse which had formerly been hidden from view. The first stage of the work has involved careful documentation, and planning around the handling and stages of movement and treatment in order to cause the least possible damage. This has also allowed time for the conservators to gain an understanding of the construction and nature of the object. The hanging is extremely fragile and is lined with linen. The lining shows evidence of previous hanging techniques, such as looped cords, tack holes and tapes. The lining was found to be extremely dirty, damaged and seams coming apart. Previous repairs have been worked through to this outer lining. These repair threads are rotten. After initial cleaning trials a decision was made to remove it in order for it to be treated separately and for the back of the appliqué to be exposed so that a new support could be added. On removal of the lining original construction details were revealed. As had been thought, a base linen was first made up to the required size and broad outlines of the design painted on. Appliqué elements were worked separately with their own linen foundation and then applied to the base linen. The number 3 was found painted on the reverse. Also visible are the letters PER indicating the position of one of the figures, namely Perseverance. Most of the lining has now been removed. The textile historian, Santina Levey, who has written extensively about the Great Hangings, visited on the 4th October 2011, and it was hoped she may shed further light on initial findings. Following this visit the lining would be removed altogether so that it can be properly cleaned. Vacuum cleaning of the reverse will be completed, allowing the application of a full support of new linen, before the hanging can be turned uppermost and the main treatment started. A meeting between people sharing the same passion and enthusiasm is always inspiring and that was true of our further examination of the hanging under Santina Levy’s expert eye. She suggested that the hanging may have been constructed by a team who were experienced in putting together theatrical backdrops. The stitching which holds the appliqué decoration in place is quite simple and quickly executed, with evidence of different hands at work. In addition it has become obvious, whilst examining one edge of the hanging, that expensive fabrics had been specially purchased, including an exquisite narrow striped velvet, (a narrow black cut pile alternating with a stripe of yellow looped pile). This velvet which is probably Italian, is of excellent quality and has been used for the background of at least four of the hangings, thus requiring a stock of many yards. Rather than on just rely on recycling rich fabrics from ecclesiastical vestments and clothes, cloth appears to have been specially purchased for a conceived grand decorative scheme. It is also apparent that colour matching of various braids to fabrics was also an important detail. We hope to uncover more of this detail in due course. Having now removed the original lining altogether and prepared it for wet cleaning, we uncovered two small tightly rolled pieces of red wool fabric attached to the reverse, their function unknown (possibly part of insect control?). The whole of the reverse of the hanging has now been vacuumed and professionally photographed. Experiments carried out for further removal of the more stubborn dirt has shown that soft polyester microfibre cloths prove somewhat affective, but sadly there will not be a dramatic visual difference after cleaning. 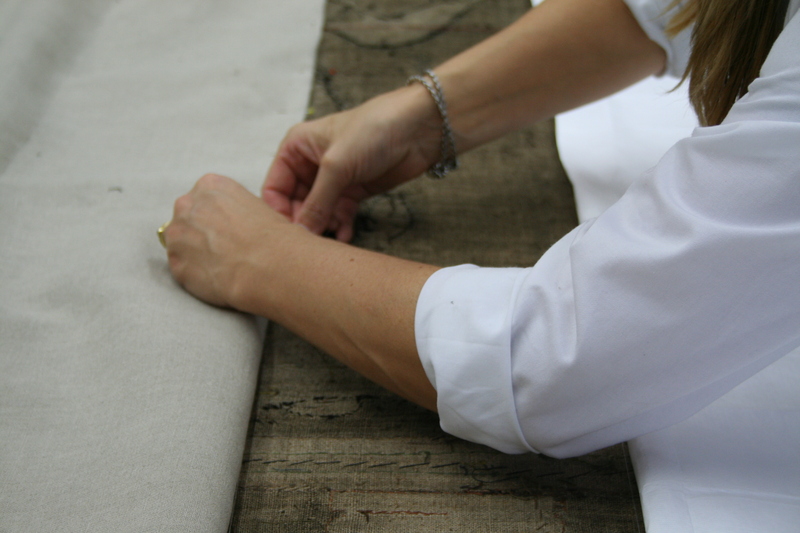 Our aim is simply to remove as much soiling as possible before applying a full support of pre-shrunk linen, which is the next task before turning the hanging over. We are now planning to install a time lapsed camera above the working area, which will be programmed to take shots at intervals, thus allowing a time lapsed recording of the work. This will be complimented by filming of the more detailed conservation procedures in real time. The aim is to produce a short 5 to 10 minute film which can be used at the property and on the NT website once treatment is completed. Let’s show some support for Penelope! In November 2011 the team concentrated on completing the gentle cleaning of the reverse and applying the full support of pre-shrunk linen. This has been applied section by section, fixed in vertical lines every 20cm across the width. Ease has been built in to allow for take up of the fabric once further conservation stitching has been undertaken. This is to avoid the support becoming too tight. Thread samples have also been taken for analysis. This month has also saw the installation of the rig and camera to record the conservation treatment over the coming months, using an image time lapse technique. This is now up and running and images are taken every half hour. In addition the photographer, who will be monitoring the time lapse record and compiling the final film, spent half a day at the studio capturing the working environment, filming Philippa and Rachel attaching the lining and the dyeing process. This ‘real time’ filming will be used to show the detail of the work. Once the support linen is fully secured the hanging will be turned right side uppermost and the detailed work will begin to secure the appliquéd elements. During the three months of Dec, Jan & Feb 2011/12 work on attaching the support lining has been completed and the hanging turned over to reveal the right side. During a meeting with National Trust regional conservators and the House and collections manager from Hardwick, we reviewed the specification for the conservation work and established our choices for the dyed fabrics we would use. The studio team explained the problems posed by the object and proposed solution options. There followed an ethical debate about the retention of past repairs and the need to ensure that as much evidence of original construction be retained, whilst enhancing areas where losses of material interrupted the visual appreciation of the object. The knotty problem of redisplay was touched upon, as everyone agreed that returning the hanging to its position in the Entrance Hall at Hardwick was undesirable on a number of levels. The support and strengthening of the damaged top and bottom edges has now been completed, the yellow and yellow/brown velvets being further protected using fine dyed net overlays. Losses of a black braid have been subtly in-filled using the selvedge of black dyed crepeline. The very fragile and fragmentary black velvet of the entablature has also been treated using infills of dyed silk crepeline and net overlay. These treatments have been highly successful and have provided a taste of the level of both visual and structural improvement that will be afforded to the rest of the hanging. The team have been concentrating on treating all the outer edges, and now, as well as the top and bottom edges, the two side edges have been completed. the work is painstaking and often slow. The thickness of some of the appliqué areas makes stitching with a curved needle difficult and great care is taken not to cause further damage to the fragile fabrics. In some small areas of loss and fragmentation gaps are infilled with dyed silk crepéline treated with a conservation adhesive which is solvent activated. Dyed net is then placed over the area to preserve the fragmented fabrics. this allows any exposed linen to be ‘knocked back’ visually, giving more coherence to aspects of the design. The original lining had been sent to De Wit, in Belgium, for special cleaning using an aerosol suction method and returned to the studio transformed and ready for repair, which will take place at a later date. The team have reached the half way mark and are treating the central portal around Penelope herself. A large black fabric patch, a former repair, was gingerly removed to see what lay beneath. we found that the original silk velvet, though worn and fragile with numerous vertical splits, was in fact there and worthy of exposure. Pip and Rachel experimented using different colours of silk crepéline overlays and net to infill missing parts and the supporting fabrics are now being put in place. More discoveries have been made along the way, such as the colours of unfaded braids which have been partly hidden underneath other fabrics, the padding applied beneath the coat of arms together with more underdrawing. Treatment of the head of Perseverance was carried out to secure the few remaining pieces of silk which once covered her entire face and sadly now missing altogether on her hands. 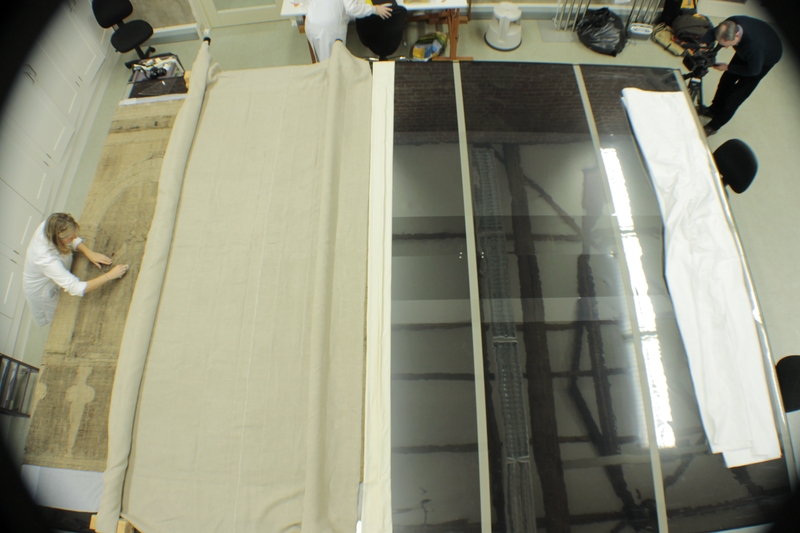 The silk fragments have been held in place with an overlay of transparent silk crepeline treated with a conservation adhesive reactivated with solvent. Loose metal threads and surface embroidery have also been secured. At this point 1139 hours have been spent on the treatment and excitement is mounting as we approach the treatment of Penelope herself. Unhappily her dress is in tatters and like Perseverance she has lost her silk face – but the drawing is still there and her lovely features still remain visible. Over the last few months we have had several groups coming to see the intricacies of the work on Penelope, these have included the director of Grants for the Wolfson Foundation (who together with the National Trust have co-funded the project), colleagues and students from the Victoria and Albert Museum and members of the National Trust Associations. Between July and November 2012, 770 hrs of further work were achieved. Once the half way point was reached a decision was made to start working from the opposite side of the hanging, leaving the treatment of Penelope’s draperies, which are in very poor condition, until the end. A marked visual improvement was made when unsightly repairs were removed from the figure of Patience, perhaps more akin to plastic surgery! Penelope herself awaits her turn. The skirt of Patience after removal of old repairs. 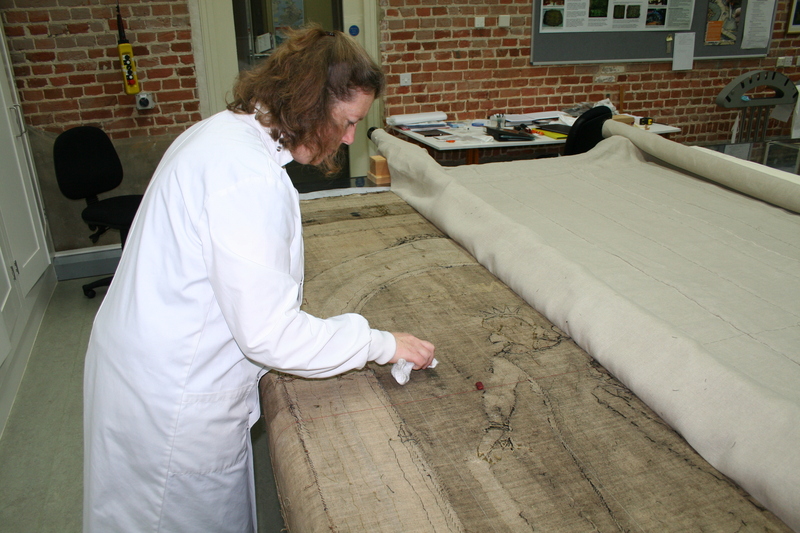 The fabric has been secured and the fold impressions in the cloth reinstated. The original lining, wet cleaned at the De Wit workshop in Belgium earlier in the year, has now also been repaired and is ready for re-application once the main treatment has been completed. The conservation techniques that we have developed and used to date have been extremely effective and our original estimate is proving to be sound. We have started to consult with property staff over the means of re display at Hardwick. This will involve a new supporting framework on which the hanging will be mounted, an outer frame and glazing. The size of the hanging and access at Hardwick creates a challenge, but we are currently seeking advice and looking at all the possibilities. The end is in sight….. Finished at last! And the three girls Penelope, Perseverans and Paciens look revitalised and ready for at least another 100 years in the public eye. Penelope herself has now been treated. Her fragmenting painted hands have been given an adhesive crepeline overlay and the few remaining loose silk fragments on her face stuck down. Her dress has been cleaned, tidied and netted and loose appliqué elements restitched into place. Most striking has been the transformation of her portal after the removal of the previous unsightly patch. Missing areas in the portal have now been replaced with infills of dyed silk crepeline treated with a solvent activated adhesive. The whole of the portal has then been covered with a layer of dyed nylon net. 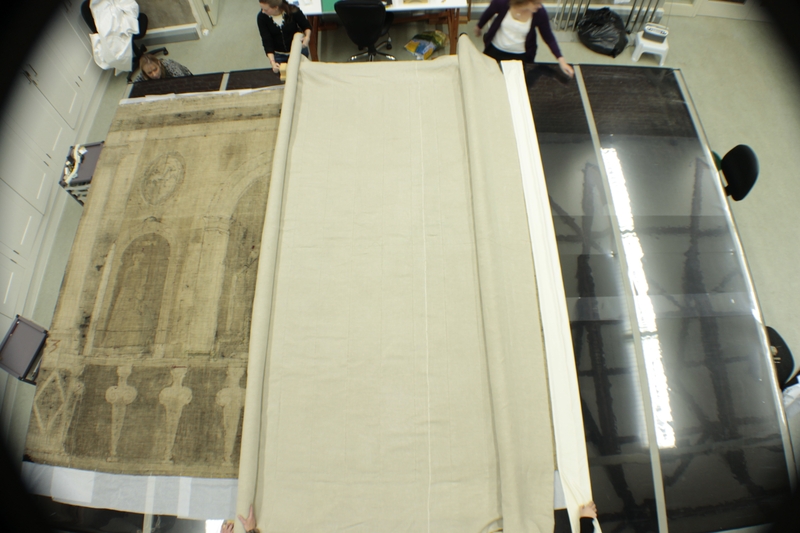 After treating the front, the conservators carefully turned the hanging over using a large padded roller and reattached the washed and conserved original lining. Now the right way up again, Penelope is receiving her final photo call and the conservation report is being written. A meeting on site with conservators, the House and Collections Manager and house staff at Hardwick is planned for April, so Penelope has to wait a little longer for a final decision on her display but she will soon be packed and on her way home. The timelapse project is now a fully fledged video and can be seen on Youtube.